The Highest Quality Artist Renderings. My name is Joseph A. Galantino, and I have been supplying original artist renderings, floor plans, site plans, sales office displays, brochures, closing gifts (Client's home portraits) and more to the real estate industry for over 40 years. My renderings are hand drawn and colored (not computer generated) I can also supply digital scans for ads, printing & web. I can work from supplied paper floor plans, emailed pdfs or jpegs and personal and/or phone consultations. This web site will give you all the information (samples and fees) you need to make a decision to use my services. All my fees are negotiable based on the actual project(s) and quantities. Lower prices are available for larger homes, 3D view and Color Renderings. Inquire today about this wonderful opportunity that will set you apart from the competition. We gladly accept Bank Checks and Money Orders as well as Visa, MasterCard, Discover and American Express. 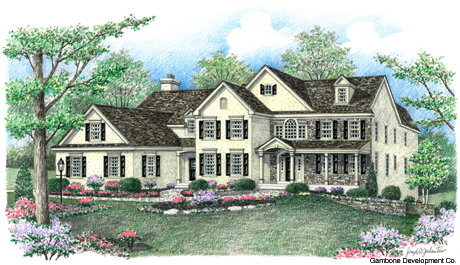 For the past 17 years I have had the honor of creating the new home renderings for the Parade of Homes publication. Click on links to view each rendering.